The road followed what was now familiar territory, passing the Mani wall, Domkar Gompa, the turn- off to the Leba gorge and finally Xiewu. At Xiewu the road divides; one way cuts across the Qinghai plateau to Xining, the other road, the one we were taking, heads up to the 4,700 metres Anbala Pass (安巴拉山口), Nganga-la in Tibetan, and into Sichuan. The road up to the pass is new and smooth; there is absolutely no other traffic. We stop at the top to take a photo. It’s freezing up here, but the views are great. 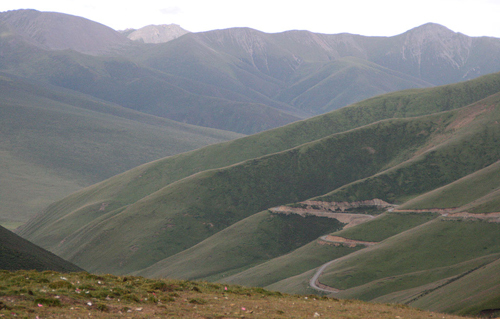 Way below the daily Yushu to Serxu bus is beginning its crawl up to the pass. 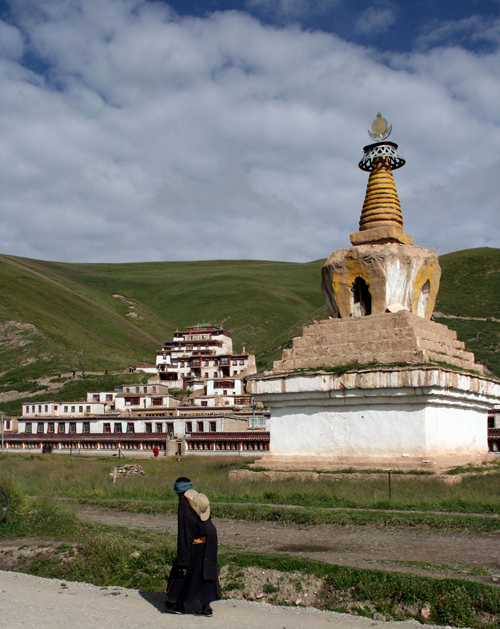 Qinghai has always been one of China’s poorest provinces, while Sichuan in recent years has undergone a bit of a boom; its capital, Chengdu, the latest Mecca for overseas investment opportunities. It is somewhat of a contradiction then, that within a few hundred metres of having entered Sichuan, the road disintegrates into little more than a potholed dirt track. A few construction teams, camped out on the plains, are the only sign that the authorities might be doing something about the situation. The lamentable condition of the road continues for the 70 kilometres that still separate us from Serxu, with our driver carefully negotiating the holes, bumps and obstacles. The scenery is wild. Signs of life are few and far between. 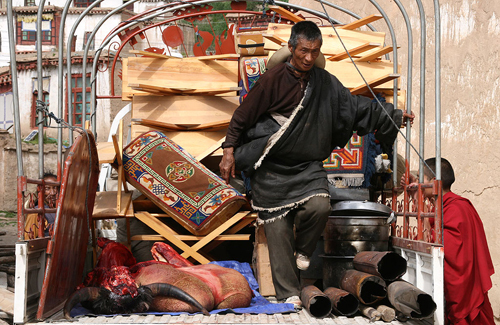 This is nomad country, home of the Tibetan Khampas, fierce, proud and handsome Tibetans, notorious in the past for their fierceness in battle, and more recently for their banditry. Their camps dot the grasslands here and there, while occasionally a more permanent, concrete construction appears. 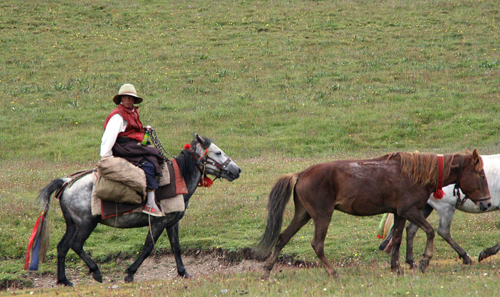 Most of the time though, it’s just yaks and horses, horses and yaks. Fortunately, we feel more than compensated for the discomfort of the road by the sight of the enormous Serxu Gompa; its glistening golden roofs providing a welcome relief to the stark and inhospitable landscape. Suddenly all is life and activity. 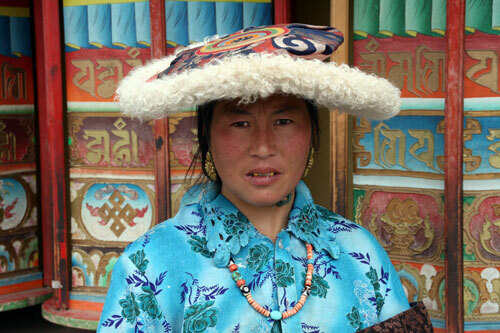 Serxu Gompa is a huge complex of monasteries, chapels, stupas, monks’ living quarters and prayer wheels. 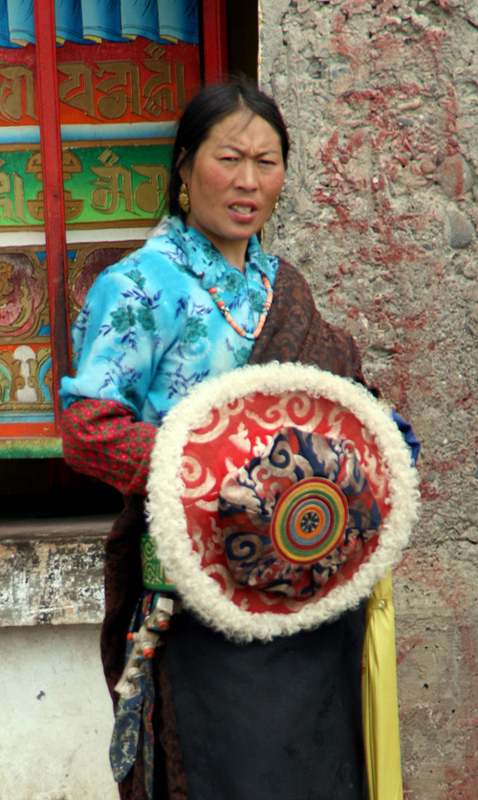 Above the monastery, there is a huge Kora, patiently tramped by pilgrims circumambulating the Gompa, while in front of the temples there is a long row of prayer wheels, which also attracts a large number of worshippers. 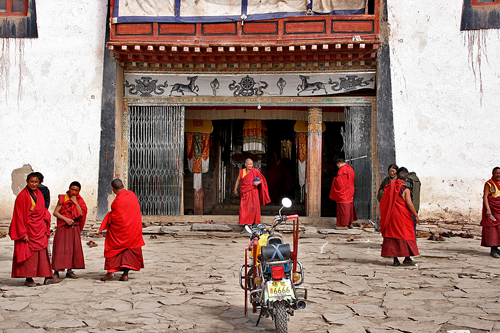 It’s hard to know just where to start exploring but, overall, the monks are friendly and welcoming; there is no entrance ticket, but doors are opened and keys found wherever we go and for whatever we want to see. 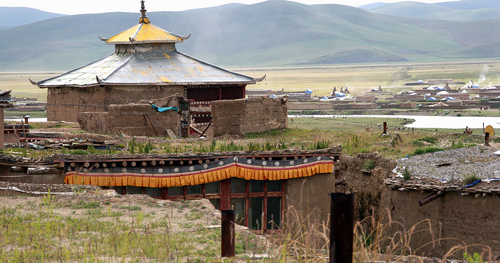 The monasteries are a mixture of old and new. 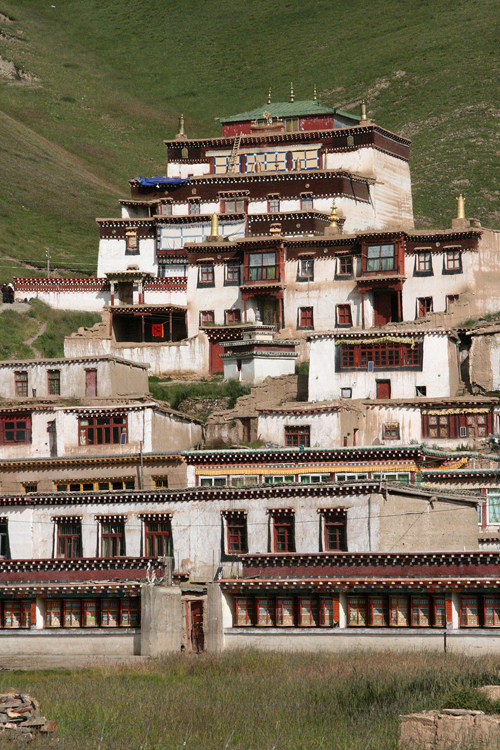 The older monasteries are quite extraordinary, even for the most templed-out travellers. Dark passageways, stairs, and rickety ladders allow for hours of exploring and offer great views, looking down onto the monks praying and chanting in the main halls. Right next to the ancient main halls are the signs of Serxu’s defiant expansion: a massive, new, concrete temple is being built here and scores of monks are bustling about on the construction site. Further new constructions are also going up on the hill side. 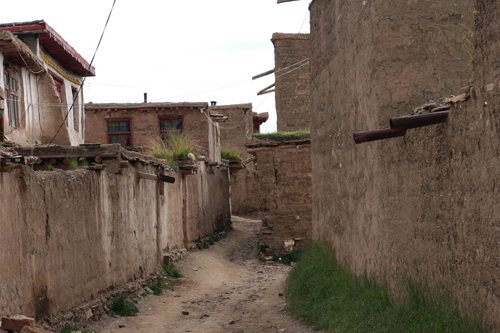 The temples are surrounded by low, mud-brick cottages, connected by narrow alleyways. 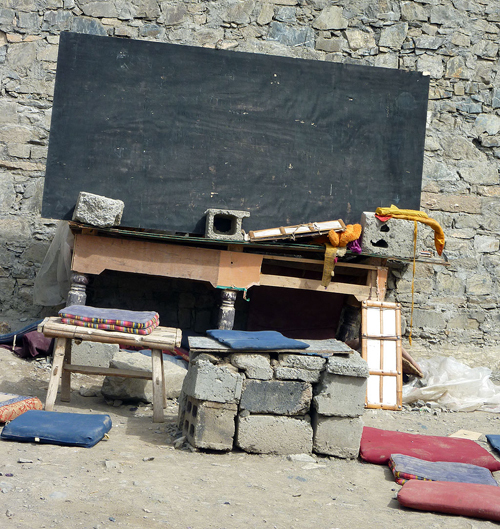 On a small square we stumble across what must be the monastery school: a blackboard mounted on a pile of bricks, with a pile of dusty cushions in front of it. A river separates the monastic village from the old Tibetan town of Serxu Dzong; a warren of mud brick buildings and shops. 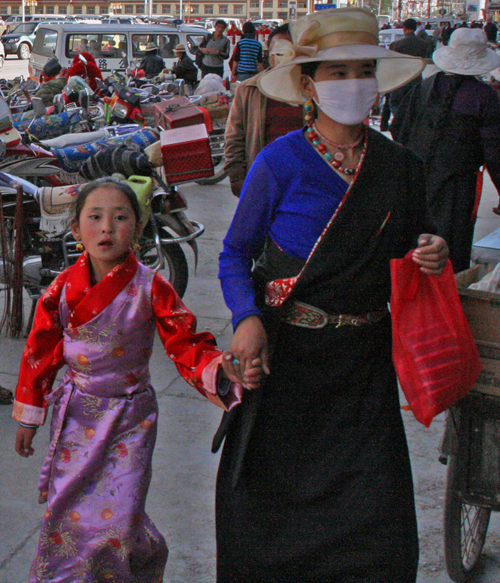 The main street is lined with small businesses selling the necessities for life on the grasslands, such as heavy coats and riding boots, as well as all the paraphernalia essential for being a good Buddhist. 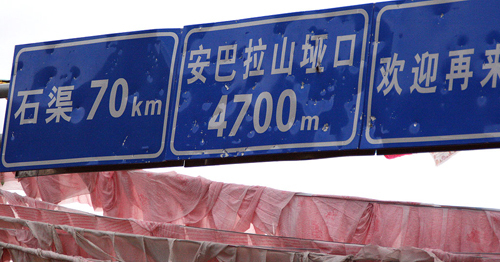 The modern new town, known as Shiqu Xian, is still an hour’s drive away. Here the 21st Century suddenly makes its appearance on the grasslands. In Serxu City you can find all the trappings of modern life – on a modest scale of course – from hotels to restaurants, internet cafes to modern shops. 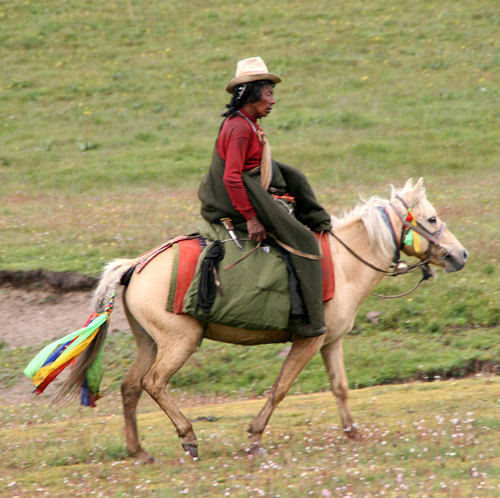 Taxis ply the streets and people dress in Western clothes. 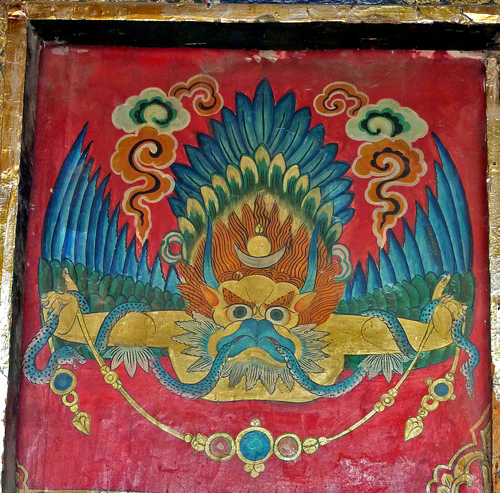 Chinese signs challenge Tibetan ones for hegemony. Getting there and away: there is a daily bus connecting the two towns; it leaves Yushu at 8am and takes around 5 hours. By taxi, it took us 4 hours. Getting around: the 30 kilometres that separate the two towns are covered by infrequent minivans. 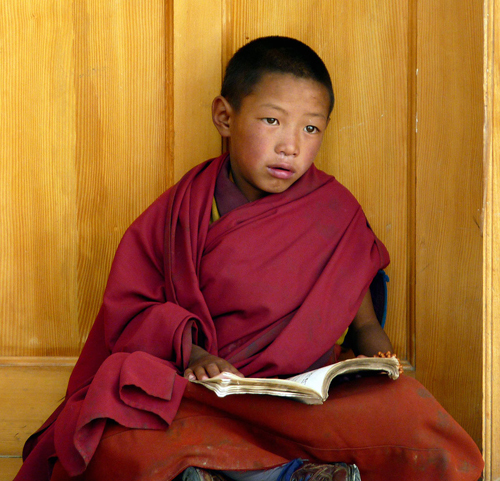 Accommodation: in Serxu Dzong you can stay at the simple monastery guesthouse. Shiqu Xian has more options. We saw the fanciest one, the Shangdeenyma Hotel, from our taxi window. It’s located on the main road and looked quite grand; at least for a town like Serxu.